CBerger Picard's are considered to be one of the oldest French herding breeds, the Berger Picard originated during the 9th century in Northern France. Used to herd both sheep and cattle, this breed nearly became extinct during World War I and World War II. Today this rare breed is slowly being revived. 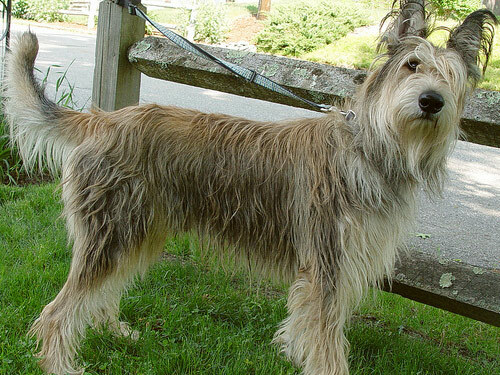 There are currently only 100 Berger Picard's known to exist in the United States and Canada. The Berger Picard is muscular and medium-sized. They exhibit a rugged yet elegant appearance, a dignified demeanor, and winsome expression. The Berger Picard breed is not recommended for first time dog owners. The Berger Picard has a sensitive and assertive disposition, is loyal, and even-tempered. They do well with children, dogs, and other pets they have been raised with. They are alert, hard-working, and energetic. Berger Picard's do not do well if they are isolated or ignored. This breed is a devoted guardian of their family, livestock, and territory. The Berger Picard requires minimal grooming. Once a month combing of the coat is recommended. Bathing will damage the weather-proof coat. Dry shampooing will suffice. Berger Picard's are prone to eye infection and hip dysplasia. The coat of the Berger Picard is dry, rough, of medium-length, and weather-proof. There is a fine, dense under coat. The Berger Picard breed is a light shedder. Highly intelligent and quick to learn, the Berger Picard breed requires early socialization and basic obedience training. This breed tends to be stubborn and moody. Short and varied sessions are recommended. Berger Picard's do not respond to harsh or heavy-handed methods. Training must be done with patience, firmness, fairness, and consistency. The Berger Picard requires an inordinate amount of physical exercise and mental stimulation. They are not recommended for apartment living. This breed does best in a rural setting with room to roam, family interaction, and a job to do.